1. Preheat the oven to 200˚C, gas mark 6. Halve and stone the plums and place in a roasting dish. In a bowl, mix the sugar, cinnamon and half of the orange juice. Spoon over the plums and roast for 25 minutes until soft and golden. 2. Meanwhile, mix together the yogurt and the remaining orange juice. 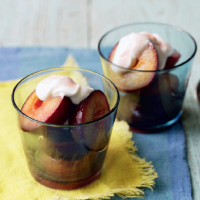 Serve 3 plum halves per person, with the orange yogurt spooned over the top.